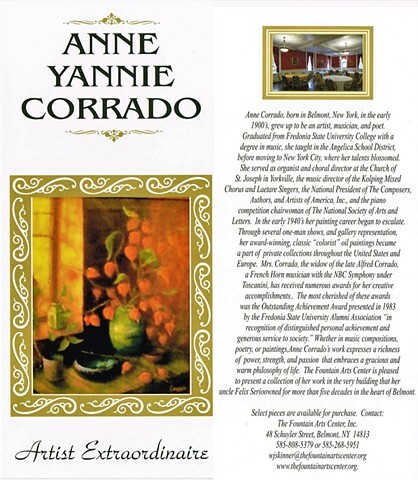 Anne Corrado, born in Belmont, NY, in the early 1900's grew up to be an artist, musician, an poet. Graduated from Fredonia State University College with a degree in music, she taught in the Angelica School District before moving to New York City, where her talents blossomed. She served as organis and choral director at the Church of St. Joseph in Yorkville, the music director of the Kolping Mixed Chorus and Laetare Singers, the National President of The Composers, Authors, and Artists of America, Inc., and the piano competition chairwoman of The National Society of Arts and Letters. In the early 1940's her painting career began to escalate. Through several one-man shows, and gallery representation, her award-winning, classic "colorist" oil paintings became a part of private collections throughout the United States and Europe. Mrs. Corrado, the widow of the late Aflred Corrado, a French Horn musician with the NBC Symphony under Toscanini, has received numerous awards for here creative accomplishments.. The most cherished of these awards was the Outstanding Achievement Awared presenting in 1983 by the Fredonia State University Alumni Association "in recognition of distinguished personal achievement and generous service to society." Whether in music compositions, poetry, or paintings, Anne Corrado's work expresses a richness of power, strength, and passion that embraces a gracious and warm philosophy of life. The Fountain Arts Center is pleased to present a collection of her work in the very building that her uncle Felix Serio owned for more than five decades in the heart of Belmont, NY. Select pieces are available for purchase. Contact the Fountain Arts Center, Inc.